The city should find a way to offer Right 2 Dream Too land to relocate the tent city currently occupying Southwest Fourth and Burnside. The argument that people shouldn’t be living in tents as an alternative to housing doesn’t hold a whole lot of weight when thousands of people are living in unfair conditions under bridges and in doorways every night. 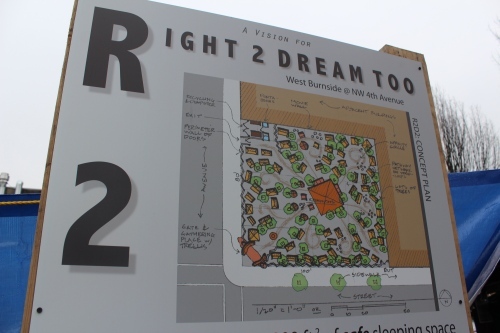 Like Dignity Village, Right 2 Dream Too is an asset to the community. Both groups have found a way to work peer-to-peer with some of the hardest brothers and sisters on the streets, giving people the hope and discipline to have something stable in their lives. The city subsidizes operating costs for many different groups that work with people experiencing homelessness and poverty. Right 2 Dream Too should not be considered any different. The group has proven to the community that they are organized and have what it takes to create a safe and stable environment for people on the streets. Right now, the city and Right 2 Dream Too are at loggerheads. The camp is caught in a bitter dispute between the property owner at Southwest Fourth Avenue and Burnside and the city, ultimately leaving the fate of the camp in the hands of Commissioner Dan Saltzman and the Bureau of Development Services. Commissioner Nick Fish and the Portland Housing Bureau should step in. If Right 2 Dream Too is going to be successful, it’s going to be the leadership of the Portland Housing Bureau that makes it happen. Right 2 Dream Too has the support of local foundations, organizations such as Street Roots, and many other community members. It’s time for the city to support the group. In a time of great need, when housing for people experiencing homelessness continues to be one of the biggest challenges in our community, we’re looking to both Right 2 Dream Too and the City of Portland to find a way to do the right thing.